This winter walk is a chance to explore the charming little village of Vers-l'Eglise. Part of the route follows the “Grande Eau” river, the other takes you up to the hills above the village, offering exceptional views of the Les Diablerets mountains and the village. At Les Diablerets station, cross the railway tracks and follow the Chemin des Côtes, along the cross-country ski trail to Vers-l’Eglise. 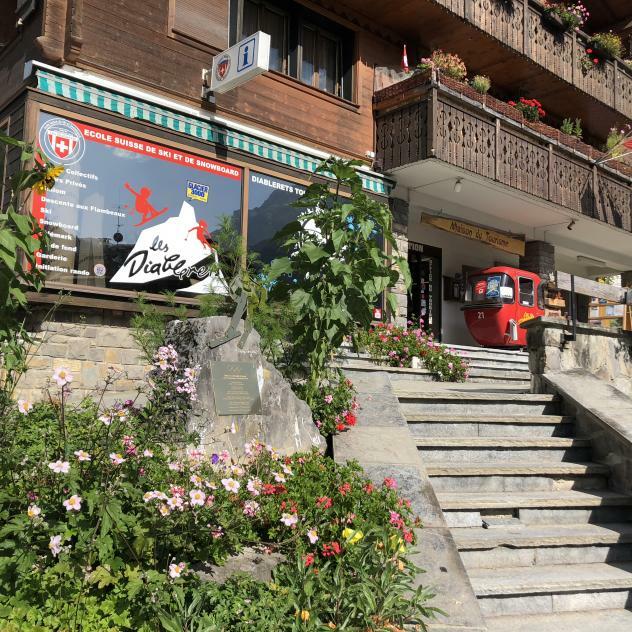 Before crossing the Grande Eau, explore the little village of Vers-l’Eglise, the main centre of the Ormont-Dessus area (administrative name for Les Diablerets), and its museum. The Auberge de l’Ours, the delightful and typical village inn is perfect for a little break. Then take the time to stop at the Musée des Ormonts with its exhibitions on themes related to the valley. After stopping off in Vers-l’Eglise, continue your walk by climbing back up the main road, then cross the main road and continue along the path that takes to you to the Hôtel du Pillin, an historic establishment. Then continue along the Chemin des Bovets to Les Diablerets. All along the walk, you can enjoy, admire and gaze upon the magnificent views of the beautiful Les Diablerets mountains.